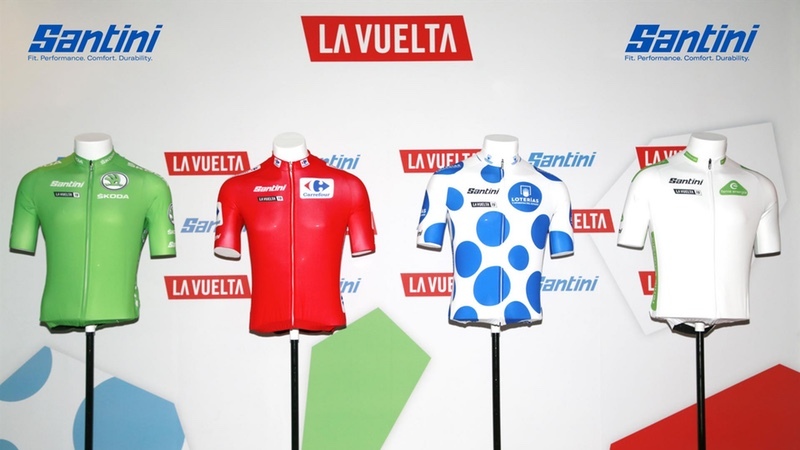 Santini and Unipublic chose the atmospheric backdrop of the Sala Equis cine-bar in the heart of Madrid for the presentation of the four official leader jerseys for the 2019 edition of La Vuelta. This is the third year of the partnership between the Italian company and the Spanish road race, organised by Unipublic, which is also one of the milestone events on the UCI World Tour calendar. In addition to the leader jerseys, five Santini-designed kits dedicated to different highpoints of the Spanish race were also unveiled. Designed and manufactured entirely in Santini Cycling Wear’s Bergamo premises in Italy, the four official jerseys for the 2019 edition of La Vuelta are made from high tech fabrics. The Loterías y Apuestas del Estado-sponsored Polka Dot Jersey is for the King of the Mountains. In addition to the official jerseys, Santini has also designed and made five kits comprising jersey, bib shorts, socks, cap and gloves. These celebrate some of the most iconic stages and points along the route of the 74th La Vuelta: KM Cero, Costa Blanca, Los Machucos, Asturias and Toledo. The KM Cero jersey is dedicated to Puerta del Sol, one the Spanish capital’s most famous and important squares. It has a blue background with a red and yellow central block of colour in homage to the Spanish flag. The first five stages of La Vuelta 19 are on the Costa Blanca. The colours of this region, and those of the salt lakes and the sea in particular, are central to the design of the Santini kit celebrating it. The front of the jersey is adorned with 21 bars representing the 21 stages of the race. The first five are highlighted in pink with a palm on the first to symbolise the Costa Blanca’s signature tropical vegetation. The jersey dedicated to the 13th stage that will see the cyclists tackle the daunting Alto de Los Machucos climb, is blue and green, in a nod to the countryside of Cantabria, a region on Spain’s north coast. The Alto de Los Machucos climb also presents the field with a gruelling 28% gradient. Santini has also created a steel grey kit with vermillion details to celebrate Toledo, which hosts the finish line of the 19th stage. The vermillion is borrowed from the city’s historic coat of arms, while the steel grey references Toledo’s ancient tradition of sword making. In fact, the 19th bar on the front of the jersey also features a sword. The word Toledo is flanked by two wings in homage to the great Spanish cyclist Federico Martín Bahamontes who was nicknamed the Toledo Eagle. The La Vuelta leader jerseys and the five special kits are available for purchase from the Santini Maglificio Sportivo site (www.santinisms.it), the official La Vuelta store, Deporvillage (www.deporvillage.net) and from select cycling stores worldwide. Exclusively for the Deporvillage online store, Santini has also created two extra jerseys dedicated to Alicante and Madrid, which can be purchased from the www.deporvillage.net site. Unipublic is the Spanish subsidiary of the French group A.S.O (Amaury Sport Organisation), organizer of 270 sporting events in 20 countries worldwide, among them the Tour de France and the Dakar Rally. Unipublic and A.S.O work jointly with the objective of accelerating the Vuelta’s development and presence internationally, as well as contributing to the strengthening of cycling as a sport, both within and outside Spain.